Upon his father’s deathbed, choreographer Hervé Koubi learned late in his 25th year that his family’s origins were not from France, but Algeria. This dramatic revelation opened the door to Africa for him in a poetic quest of rediscovery and search for his family’s roots. As part of this journey he auditioned dancers to create a work that would reveal his story. Out of the 250 dancers who showed up for the audition mostly versed in hip hop and capoeira 249 of them were male. Twelve men were chosen and with these “found brothers” he coproduced “What the Day Owes to the Night” over a three-year period taking the title from Yasmina Khadra’s novel. On Saturday evening Koubi recapped his tale with a charming French accent on Saturday evening to what seemed like a San Franciscan audience made up mostly of enthusiastic French nationals peppered with the usual ODC dance enthusiast. Following Koubi’s heartfelt opening (where he endearingly referred to notes to check his English) the dancers appeared en masse in a puppy pile on the dimly lit smoke-filled stage. From this dreamy tribal sleep they began to rise like independent bursts of energy slowly group to individual they shifted back and forth into a variety of groupings and tableaus. The shirtless gym buffed men were dressed in white skirts with white pants, designed by Guillaume Gabriel that according to Koubi were inspired by 19th century painters like Delacroix. The men low lunged into hybrids of kickboxing, capoeira, and casual walking before they impressively tossing forward and backwards through space in double back and double front flips. They tumbled into side flip-round-offs, catapulted off of one another, climbed up each other before they leaped into space and were thrown into space from human trampolines. They twirled like whirling dervishes with skirts flowering in space as the music they danced through went from Sufi rhythms, Bach punctuality, to Hamza El Din strumming his Nubian oud. 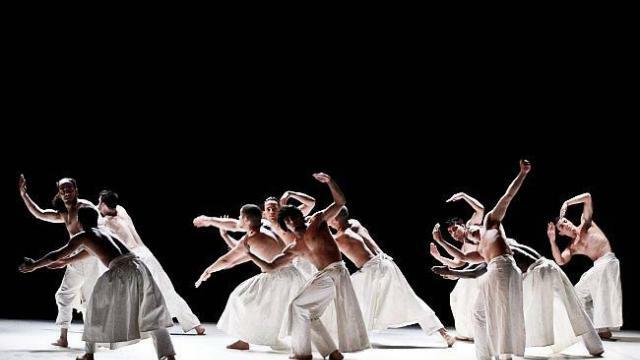 As dervishes they whirled not only on their feet but also on their heads like breakdancers with grapevines of men obscuring them or engulfing them, which kept these feats from being center stage and more as an integrated movement or as part within the entire piece. Over time the choreography felt repetitious with endless variations having revealed too much of its repertoire and highlights too soon. Within the first 20 minutes of this hour-long work much of what it had to say technically had been accomplished with shifts in music being the only primary development. “What the Day Owes to the Night” fluctuated between an elaborate capoeira exposition, an impressive and affable cultural exchange program and, dance theater. Tribal culture and male companionship was more implied then felt, with innocent testosterone-strutted machismo and male stoicism filling in the gaps. Even near the end of the performance, when their skirts were used to shroud limp bodies as if for burial, the bonding was inauthentic, with little emotional connection. Adding this missing element would have taken the performance to a more fully integrated vision, connecting choreography to its poetic intent. Maybe it was more than two worlds that Hervé Koubi discovered in his walkabout, a process still being integrated.